A main thrust to my trip was the goal to complete one of New Zealand’s nine Great Walks (with a tenth to be added in 2019). An appropriately-timed article about NZ’s huts sparked my interest, and I set out to find one that would fit neatly into a two-week itinerary. 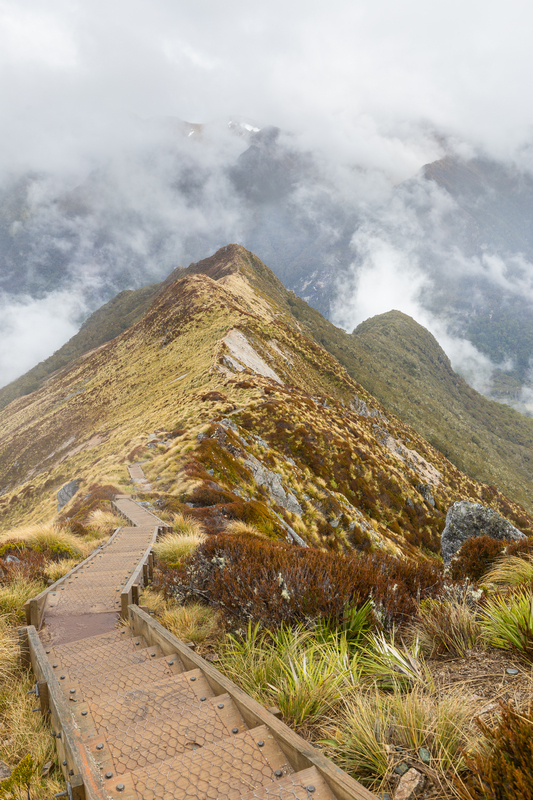 Best known for its views is likely either the Milford or the Routeburn, both one-way treks, but with time at a premium the only one easily accessible on the South Island was the Kepler Track, a four-day, ~60 km loop initially conceived specifically to be a Great Walk. 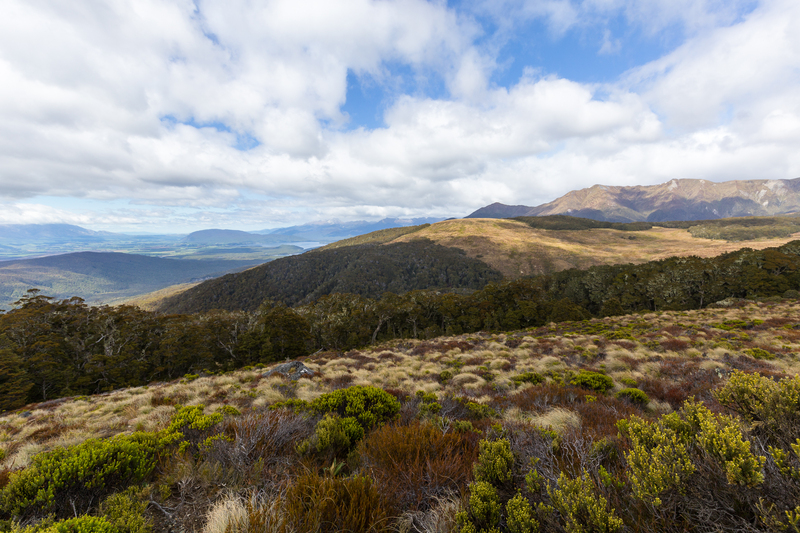 Rates historically had been reasonable: even in Great Walks season, huts ran for around $45 / night (USD), but the 2018-2019 season marked the first time NZ’s Department of Conservation differentiated between foreigners and Kiwis in their rate model. I wavered at the new 130 NZD (around $85 / night) rate, more or less the same price as what I had on the two days on the Europaweg but without dinner or breakfast or heating or sheets or a blanket. I eventually decided that my trip to NZ could nevertheless only be complete with a bit more ruggedness and ponied up for the Kepler, placing the excursion in the middle of my trip. My 60 L pack stuffed full with a sleeping bag, multiple changes of clothing, four dinners of freeze-dried meals, and both my 16-35 and 70-200 lenses, I set off in the forest around Lake Te Anau on an overcast but dry Sunday morning. I met an Australian couple who had done Great Walks before, my worries of sleep-depriving snoring and a lack of potable water subsiding as we romped along the flat approach to the big climb the first morning. I ended up climbing faster than I thought I would despite assorted breaks to relieve pressure points induced by a pack I had never used before. The first day climbed hard after a gentle approach, and clearing the tree line was almost an unexpected event. 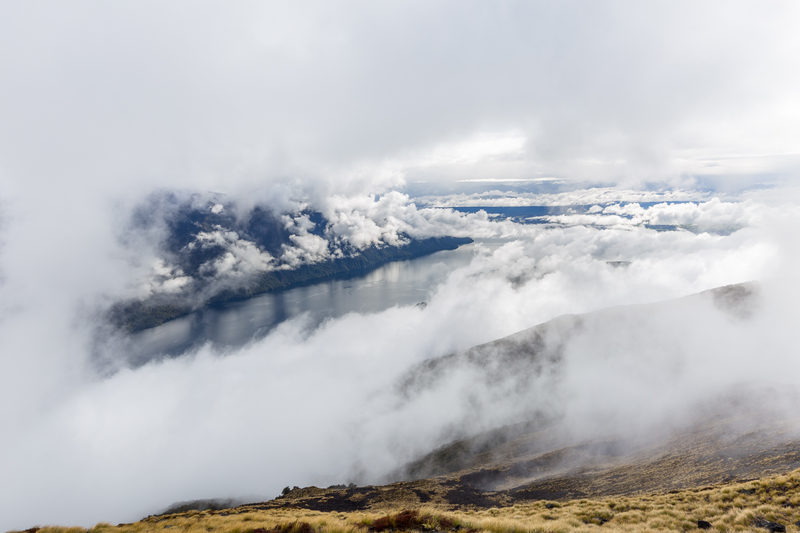 I was gaining one minute and suddenly the height of flora in my view plummeted, offering me the first glimpse of the Fiordlands expanse that I had thus far seen. 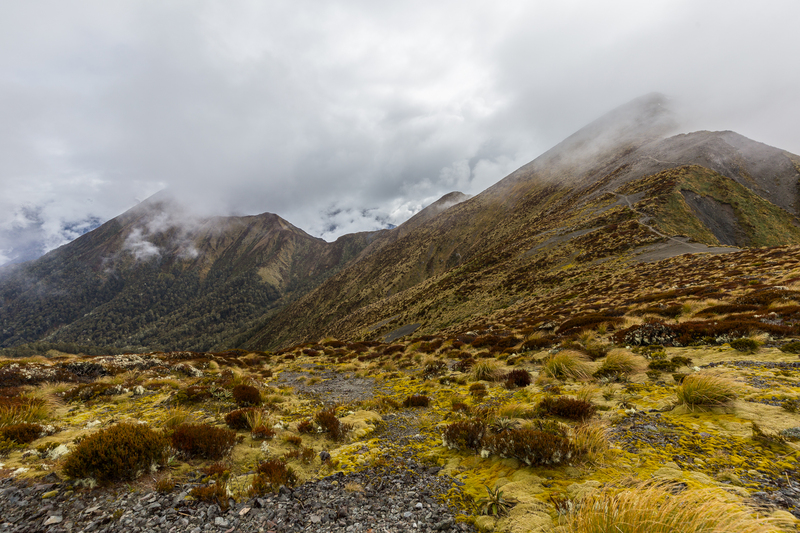 Feeling some drops of rain, I threw on a shell, joining a German transplant to Scotland who was now visiting New Zealand on the remaining ten minute trek to the Luxmore Hut. 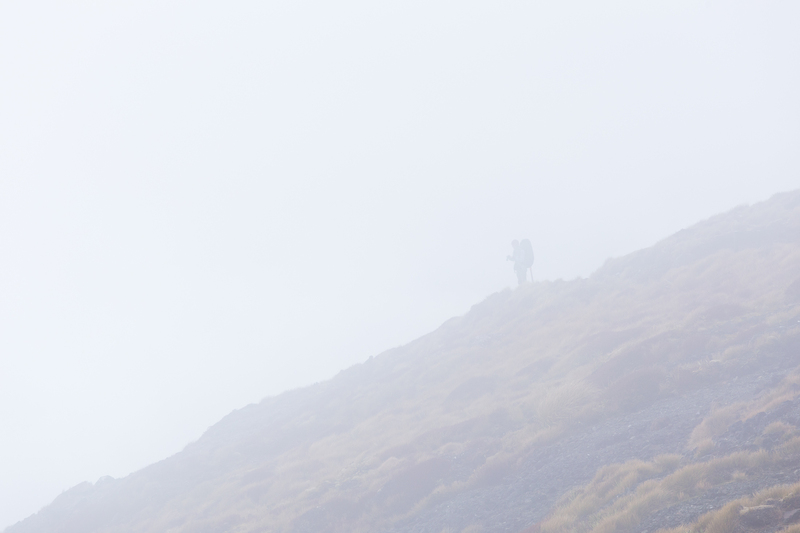 By noon I reached the hut, the first overnight stop and posted as a six-hour hike up. Having reached it in under four, I made lunch and claimed a bed, deciding not to tack on the extra two hours to summit Mount Luxmore itself after seeing the rains dance in and out throughout the early afternoon. 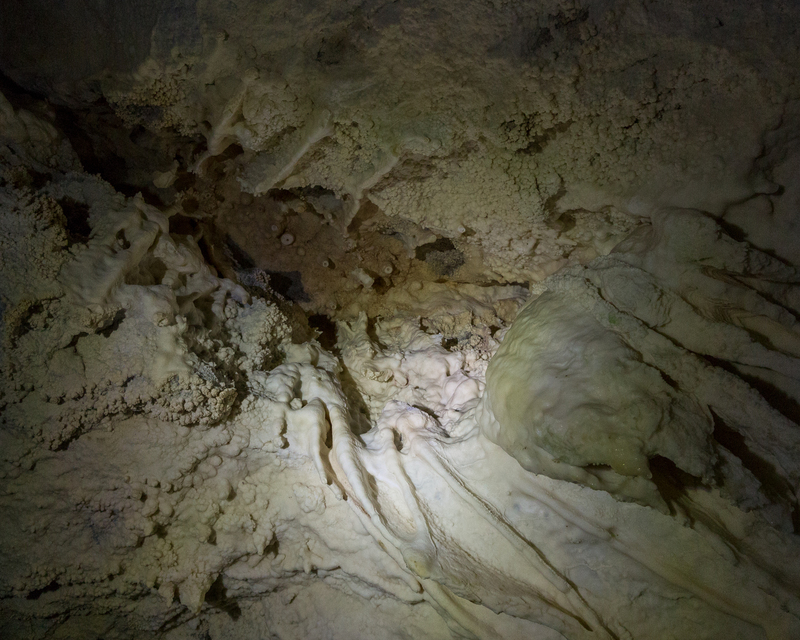 Instead, I made the five minute walk to the nearby Luxmore Caves with two other Americans who joined the hut troupe later on; there had been talk of Great Walks being dominated by foreigners rather than locals and so far it seemed the statement was holding water. The cave system was pretty extensive, but as none of us wanted to go spelunking, we headed back to the hut and met some of the others. Almost half of the roughly forty people going hut-to-hut were Australians, around a third Americans, and the rest a mixture of Caucasians. We had only one New Zealand family among us. A Hong Kong woman now living in London and I were the only two Asians. The hut we were all staying at was photographically impressive: sitting above the tree line, it offers terrific views out over Lake Te Anau and the South Fiord. 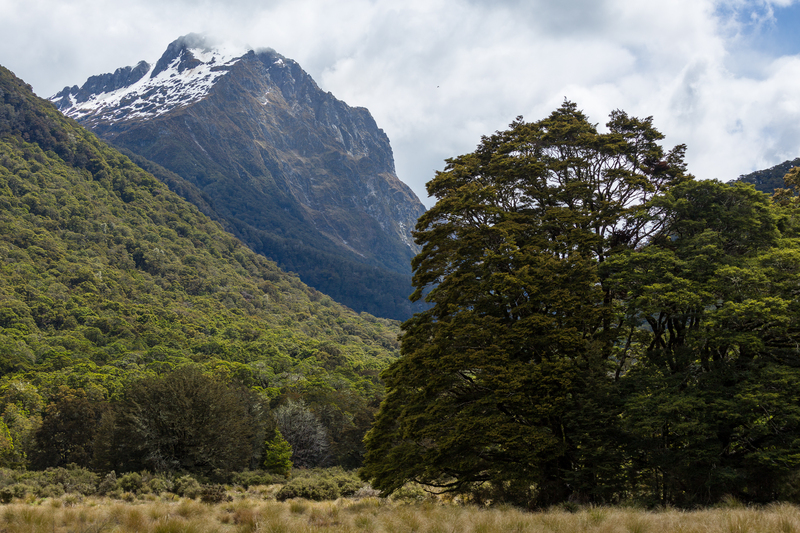 Rangers stay at the Great Walks huts on rotation, and the one during my night at Luxmore was an expert in the vegetation here in the peaks of Fiordland. Viewed from above or afar, the distinction in treeline and bushline is so pronounced one might mistake it for deforestation — instead, the trees require a certain temperature to survive, and above roughly 900 m the temperature isn’t stably warm enough, resulting in a proliferation of hardier species that hug the ground and courageously resist the wind and rain that batter them year-round. Through late afternoon, the rain remained at bay, making me lightly regret my decision not to bag Mount Luxmore. After dinner, I stepped into the wind again, using my 70-200 for the first time that day as rays of sunshine pierced through the cloud layers above. We had no colorful sunset, and I briefly commended myself for deciding not to bring my tripod. The wind began to chill my bones so I headed inside, going to sleep well before it was completely dark outside. The winds were supposed to bring rain, or even snow. As forecast, it rained and sleeted that night and into the morning, and our ranger, Pat, thought it would be 10:00 before it completely subsided. Around 8:15 I decided to give the trail a shot, bundling up in my raingear and stepping outside into the fresh morning air. We might have only been at 1000 m, but the spring air here was decidedly crisp. A light climb leaving the hut and sunshine that broke through was a great way to warm up. With the rain seemingly dissipated, for the second day I had put on the outer shell for no lasting reason. I had it off within twenty minutes of putting it on, and it stayed off the rest of the day. Above the clouds and now mesmerized by the immersive silence, I paused what might have been one a minute for pictures, my body temperature rising and falling as I moved and stopped. I passed and got passed by the others on the trail, sharing a laugh at our trail etiquette as I would pass someone, only to fall behind as I took more pictures. I had read that the second day is the day to hope for good weather, and while on the highest part of the track I was thankful not only that it wasn’t rainy and gusting — hurricane-force winds are sometimes recorded on the ridges here — but also that the clouds brought a moodiness that only compounded the elusive mysteriousness of this incredible area. The sunlight danced around the clouds, the emotion of the landscape changing steadily with it. It was getting on mid-morning, but it hardly felt it — everything here felt light and brisk, and despite a 6 AM wakeup I felt completely refreshed. What should probably have been a thirty minute climb dragged on toward the hour mark as I couldn’t put my camera down. 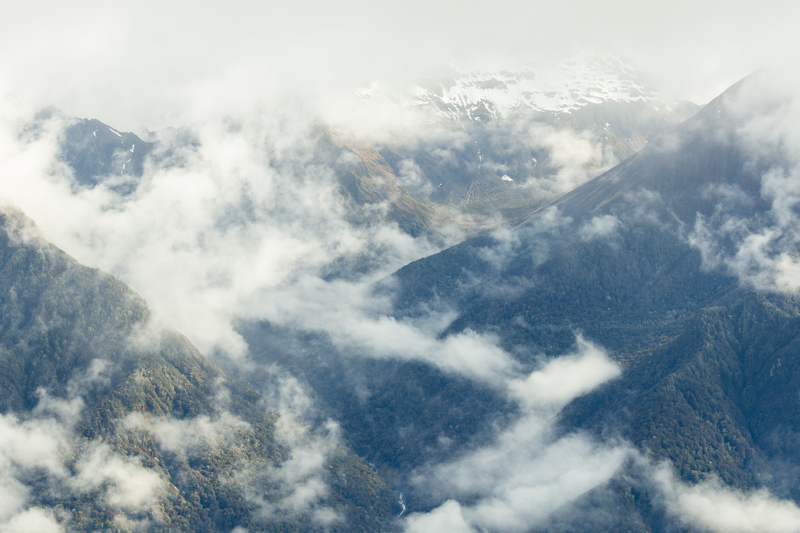 I was too lazy to switch between lenses, cursing under my breath when I had the wrong lens on: a wide-angle as clouds parted, revealing the glacier-carved lands seemingly worlds away; a telephoto when the entire scene opened up, teasing me with what lay beyond the immediate foreground. The path continued to climb, past the turnoff for the Mount Luxmore summit — now shrouded completely in cloud — and toward the Forest Burn shelter, the first of two emergency shelters on this exposed and relentless section of the trail. The first day might have put all the elevation gain squarely in one section of track, but with all the stopping and starting, it was the second day that felt more strenuous. But still the views kept coming, and the playfulness of the clouds made the walk even more entertaining and kept any onset of weariness at bay. The forty of us who stayed at the hut were all somewhere along the 16 km stretch of trail between the second hut, the Iris Burn hut, and the Luxmore, and occasionally the light would work out just enough that it was possible to see others on the trail. I intentionally didn’t look up photos of the Kepler beforehand to keep what I would see a surprise, and in hindsight I think I’d prefer having this sort of weather than clear blue skies and views of the entire surroundings. 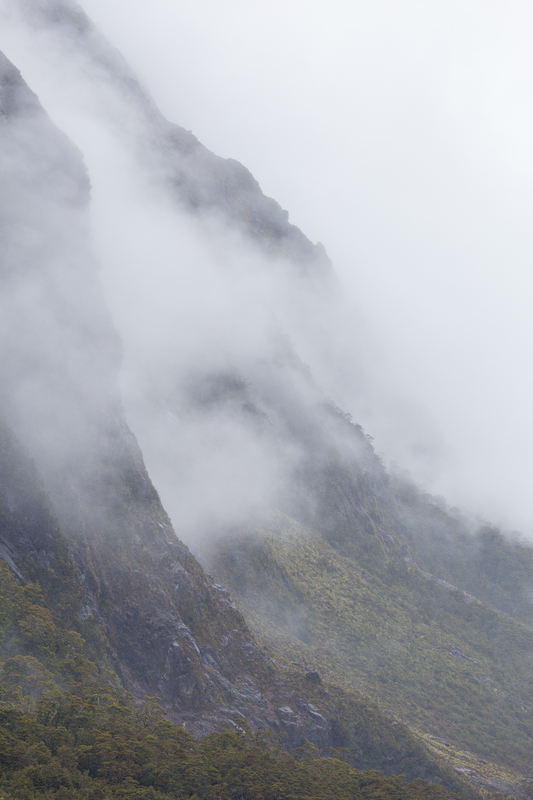 The Fiordlands are as much mystical as magical, and even though I was almost a mile above the deep chasms of the fiords there was something that just felt right about that mysticism permeating even high places. 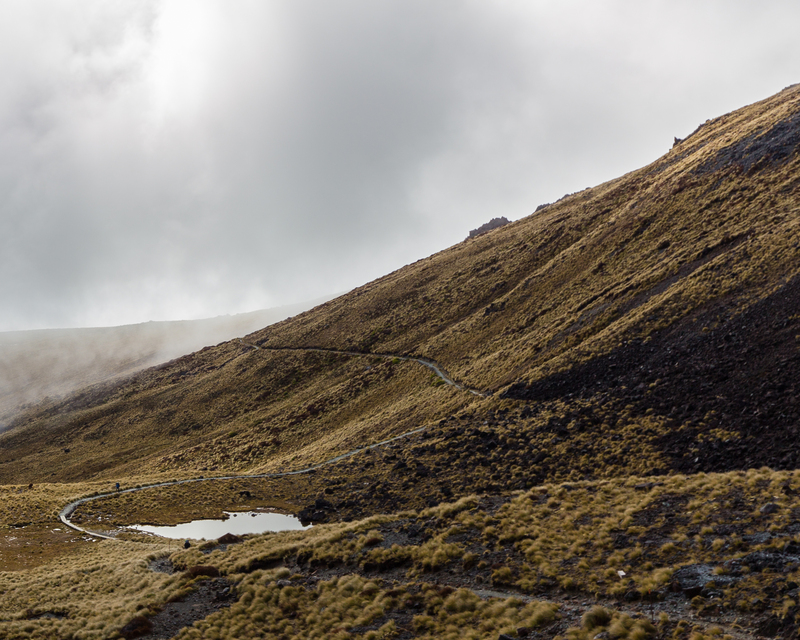 Gradually, the trail began to descend, the mist clearing slightly and leaving the clouds to hug the summits. I stopped for a granola bar — I found Clif Bars in the grocery stores here, which is more than I can say for most Allgäu grocery stores — savoring the energy now that the incessant traverses and ascents were behind me. One quintessentially-Kepler element are ridge traverses, where both sides of the ridge seem to plummet infinitely below. It’s not quite as knife-edge as the Hardergrat, but presumably that trail could have served as inspiration for the creators of the Kepler sections. Without a human subject to make the composition interesting, I never shot the ridges. Not having a ridge shot of my own injected a pang of remorse; most of the people on the Kepler were hiking in a group or as a couple, and I was among the only who was in New Zealand entirely alone. 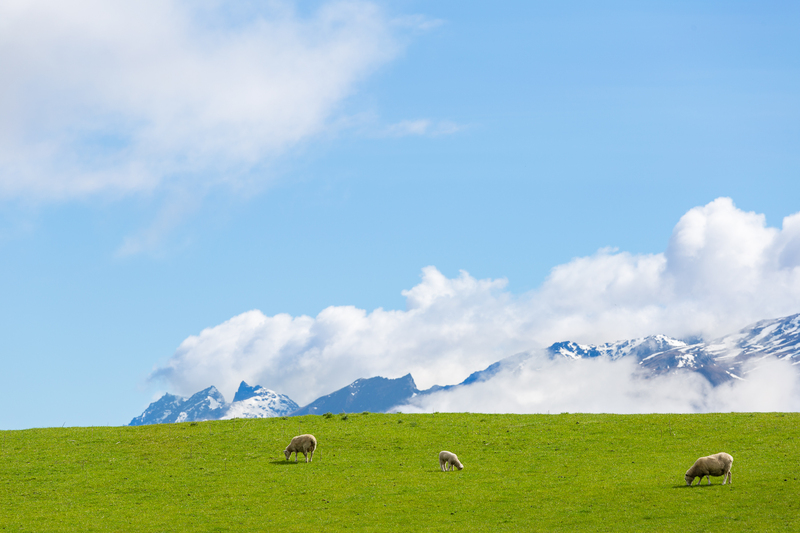 Or, rather, who had visited New Zealand alone, for despite the belief that the country is full of sheep, I was astonished at the number of visitors on this trip. I didn’t think I could stomach a third trip making me question the morality of tourism, but there are increasing indications that New Zealand, as originator of the “pristine nature” image since reproduced by Icelandic and Faroese (among other) tourism bureaus, will face tough questions about the sustainability of bringing more pairs of feet to witness that beauty with their own eyes and lenses. In that moment on the Kepler, far above civilization, my own incredulity and awe at the beauty was being satisfied one enormous serving after another, albeit in that moment without prolonged regard to the carbon footprint I left to travel half a world away. 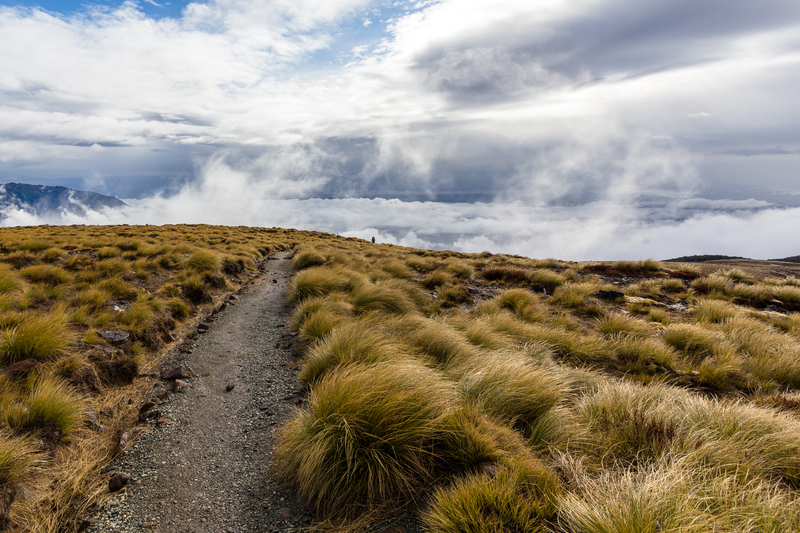 The ascent of the second day on the Kepler Track was soon met by an equally punishing descent, with the seemingly hundreds of switchbacks effectively abruptly ending meters away from the Iris Burn Hut. Though I hadn’t seen much snow on the alpine traverse, temperatures on the valley floor were decidedly higher, with small streams surging from the previous night’s rains and any melt-off. My keeper rate with handholding long shutter speeds isn’t great, but even so after a pretty long second day I confirmed my decision not to haul my tripod around with me on an off-chance that I might happen across some picturesque water was pretty sound. Mostly due to the abundance of photo stops, I needed nearly the full six hours on the second day, and I was happy to get to the Iris Burn Hut for lunch. Originally unsure what sustenance I’d bring with me on a four-day trek, after asking around it seemed tuna was a pretty common option — though not the canned-in-oil or -in-water options that used to cost $0.29 / can in the US. Instead, NZ had spiced or sauced tuna in pouches, and laid on a tortilla wrap made for a delicious lunchtime snack. I was probably burning more calories than I was consuming, but for four days the tortilla-tuna option was sufficient for a midday break. I ventured into the sunlight after lunch, taking in the views that now were markedly different from those a day prior. 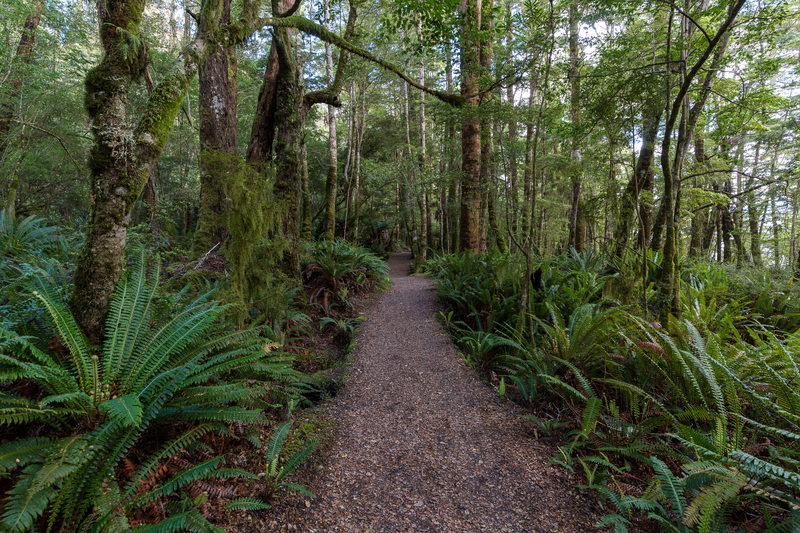 About a twenty minutes’ walk (stroll, really) from the hut is Iris Burn Falls. In the middle of summer, this would probably be a terrifically cooling dip after the long romp to the hut, but in the middle of spring the air was still chilly and the water accordingly deterring. I did my best to balance my camera on rocks and waited for patches of cloud to avoid blowing out any bright spots in the water. Balancing on rocks steadily enough for a long exposure was a pretty exhausting process without a tripod, and having to stay still give sandflies an ample opportunity to gorge. Despite having layered up to shield my skin, I ended up with over a dozen small itches that persisted for the rest of my trip. It seems even if tourists don’t leave a trace during their wanderings, NZ will do its best to bequeath each Kepler walker with a reminder of its own. A second frozen meal and a comfortable, cool sleep later, I set out for the third day of the trail. The remaining two sections would be almost entirely flat, but it was the third day that seemed to stretch the most. 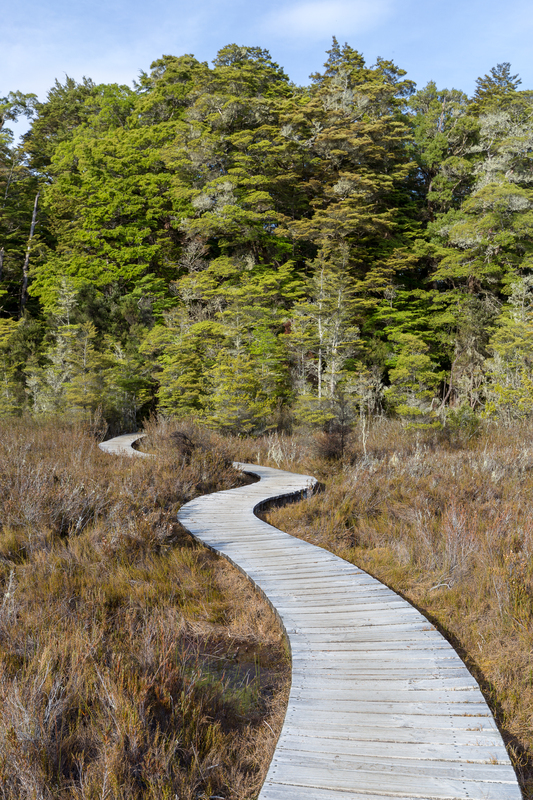 The path descends past the Iris Burn into the forest and was accompanied by no expansive vistas of the day prior. I’ve always preferred elevation gain to loss, but I’m increasingly coming to the conclusion that I’m even less a fan of flat ground. 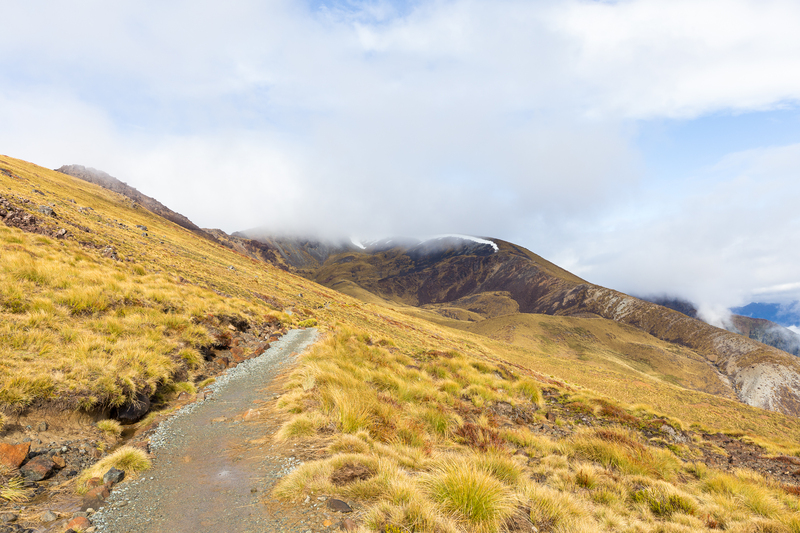 The path from Iris Burn Hut to Moturau Hut has some small climbs that after the first two days seemed to drag on even more than the previous steep ascents. It was a sunny day, and in my musings deep in the woods I was increasingly certain that the best way to experience the sections of the Kepler at altitude would be on cloudy days; gaining 1000 m even under a NZ spring sun would be brutal. I hadn’t needed to refill on water the first or second night, and had the sun been shining, I probably would have needed water both nights. 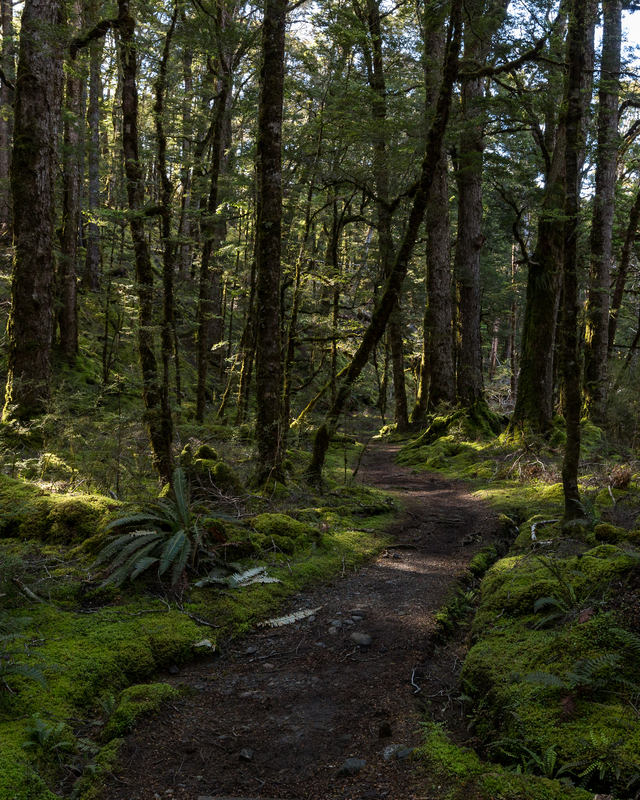 A few more breaks than I would have expected to need for a mostly-flat traverse later, the lapping waters of Lake Manapouri interrupted the silence of the forest, breaking out into the clearing in which Moturau Hut resides. The hut is in a small bay of Lake Manapouri that — even larger swarms of sandflies aside — was captivatingly tranquil at sunset. I shot the fading light until my itching hands couldn’t take the biting gnats any more, wondering if this was some obtuse way of reminding me of my future fate with Charleston’s overly friendly no-see-um population. 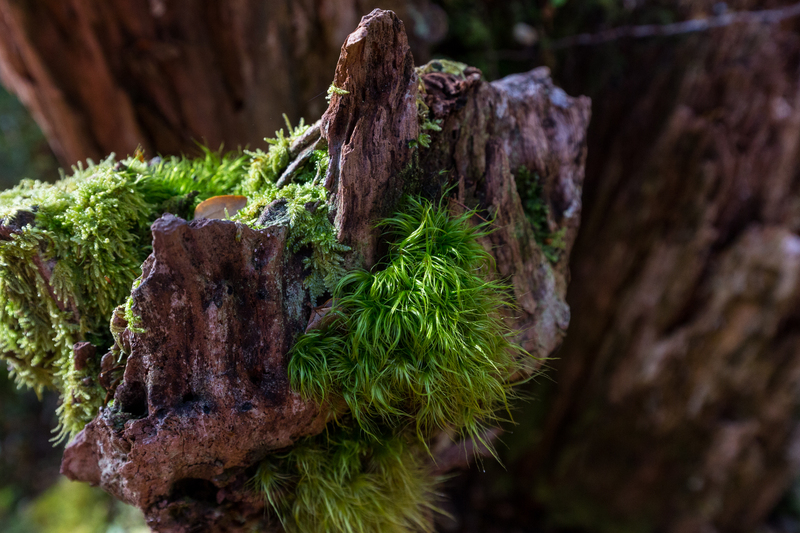 Despite my complaints about the forest, it’s said that forest walks are spiritually cleansing. 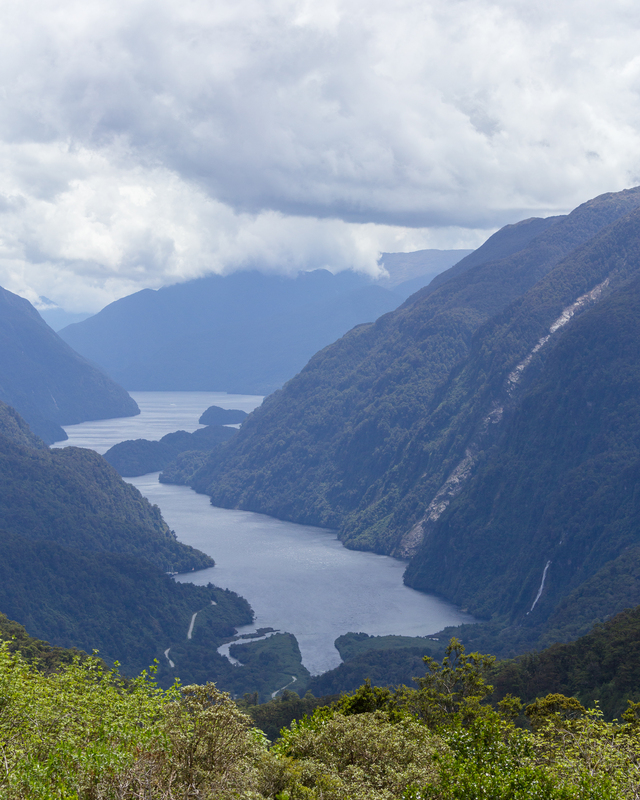 There were points in heading to Moturau — particularly when the path took me down near the soothing sloshing of Lake Manapouri — where I began to feel rejuvenated again. That could have been, of course, from the knowledge that any alpine risks were now behind me, or that I was past the halfway point on the total trail. The Kepler hadn’t been exceedingly strenuous or mentally exerting, but I was beginning to look forward to a real bed and a shower. 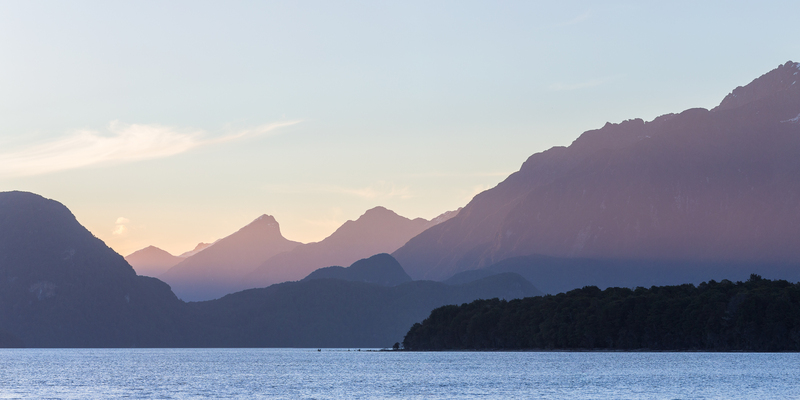 Lake Manapouri, as it turns out, was not just a pretty face for sunset. Our ranger for the evening gave a talk about environmental conservation, for which the lake is perhaps NZ’s best-known poster child. He pointed out some side trails en route to the Kepler’s starting point to be able to see grazing waterfowl or to look over the lake. I was dead-set on setting a speed record on my last day so I yielded to impatience, snapping some shots at the spots he had suggested but mostly trying to make it back to civilization so I could get laundry in before heading out onto Lake Manapouri itself the next day. Despite the detours, the final day did end up being my shortest, as I finished the trail somewhere around 3.5 hours after I left Moturau Hut. I was the first one to complete the trail, stopping in at the ranger station to let them know of a few downed trees along the way. NZ organizes a massive predator trapping system, and one convenient aspect is that the traps are numbered. On the one hand, they’re definitely frustrating reminders to any question of “are we there yet,” but on the other, for reporting issues they’re invaluable. The weather had cooperated brilliantly, a light breeze and plenty of shade cooling the abundant sunshine. 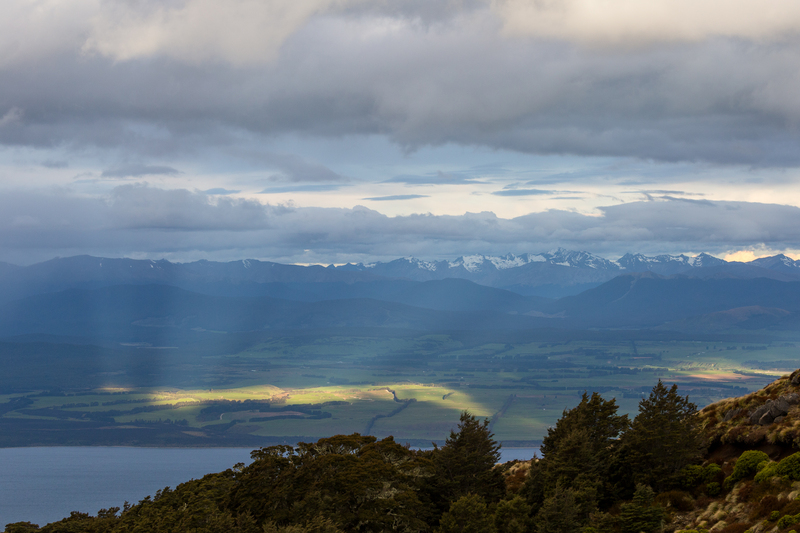 I wondered if the sunset would have been terrific from the Luxmore Hut that day, and over dinner with one of the guys I had met on the trail (who was heading the next day to Stewart Island to do the Rakiura Track, also a Great Walk), I contemplated the Kepler. It certainly wasn’t particularly difficult, and being away from civilization did feel slightly revitalizing. I heard an airplane for the first time on the third day. Some people checked cell phone reception through the trip but I kept my phone off, as I vowed to turn it on only in case of emergency. The views on the second day lived up to every hype. 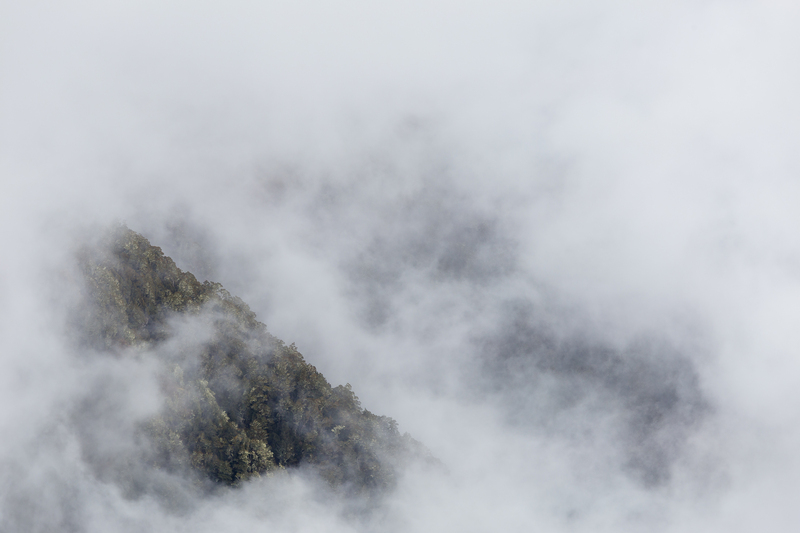 I think of New Zealand as beautiful but sporadically if not regularly moody, and of mood there was an undeniable abundance on the ridge of hills high above the fiords. 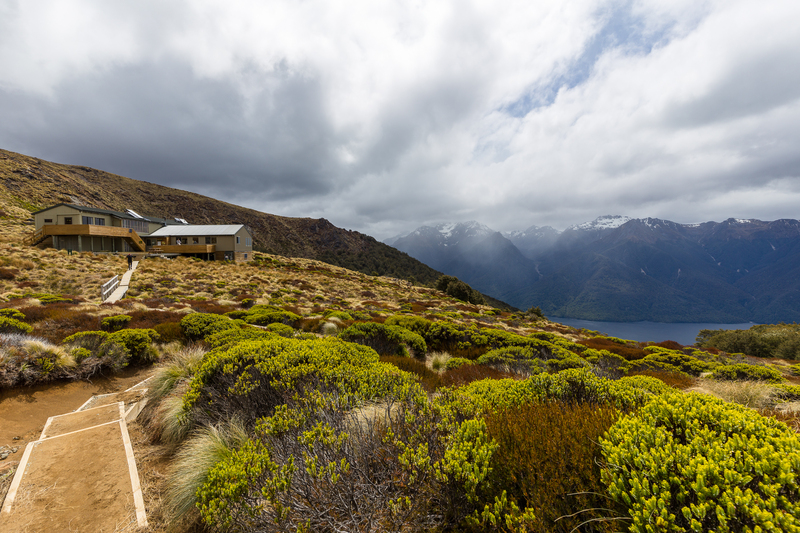 With more time… of course, with more time, I would have spent at least three days at Luxmore Hut, but even with what I had thought would be a slow itinerary, there’s always more that can be seen with more time. I don’t necessarily know whether I’d do the Kepler again, but not because it wasn’t grand or as grand as I had imagined: simply because there is so much of New Zealand that is grand that I haven’t seen. The Kepler calmed me in ways I hadn’t expected, and after the middle point of the trip I was even less eager to go back to life in my own alpine kingdom that I’ve called home since 2015. 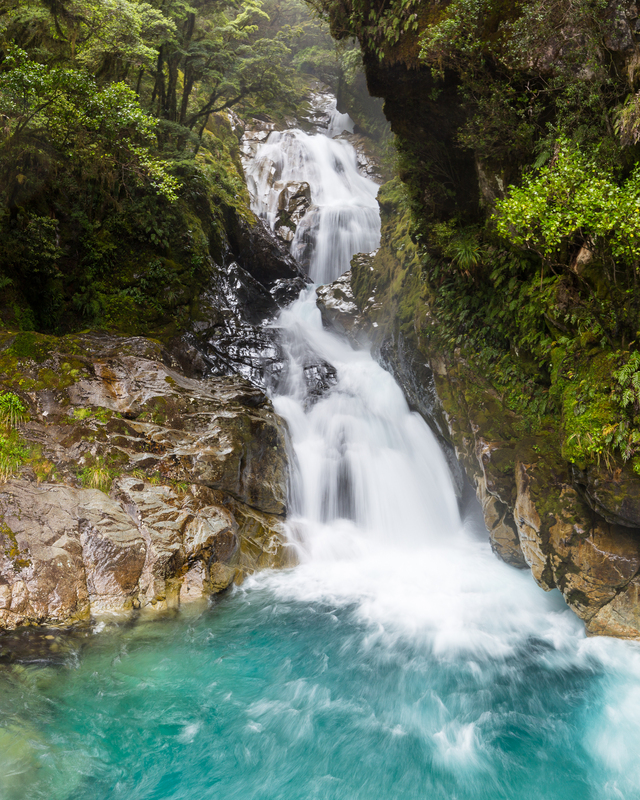 After an exhilarating evening of Chinese food and laundry, I packed my daypack for the next day, a sedentary cruise to one of New Zealand’s fiords. Coming off the silence of the Kepler, I wasn’t prepared to join the thousands who stream in to Milford Sound and back out every day. 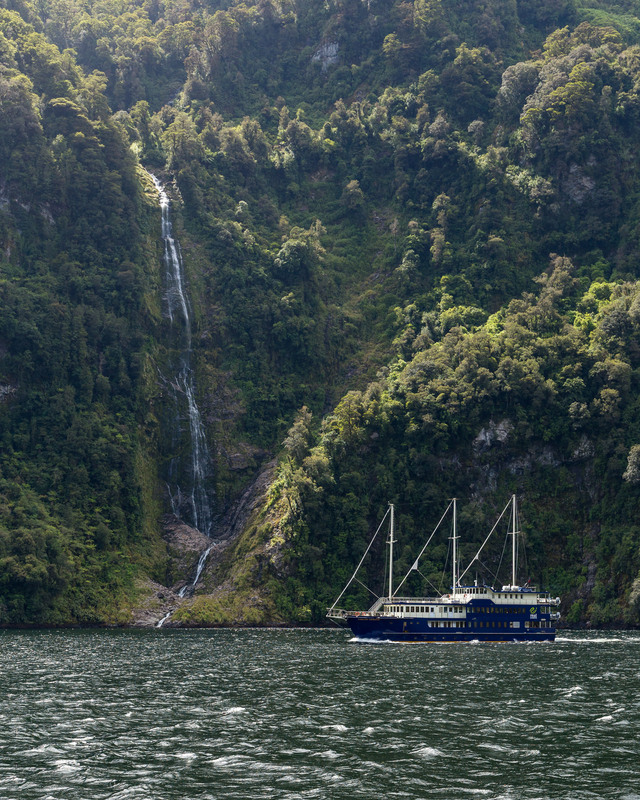 Instead, I booked a cruise to Doubtful Sound, which is perhaps just as impressive but has only a handful of sailings a day (instead of what feels like a few hundred at Milford). 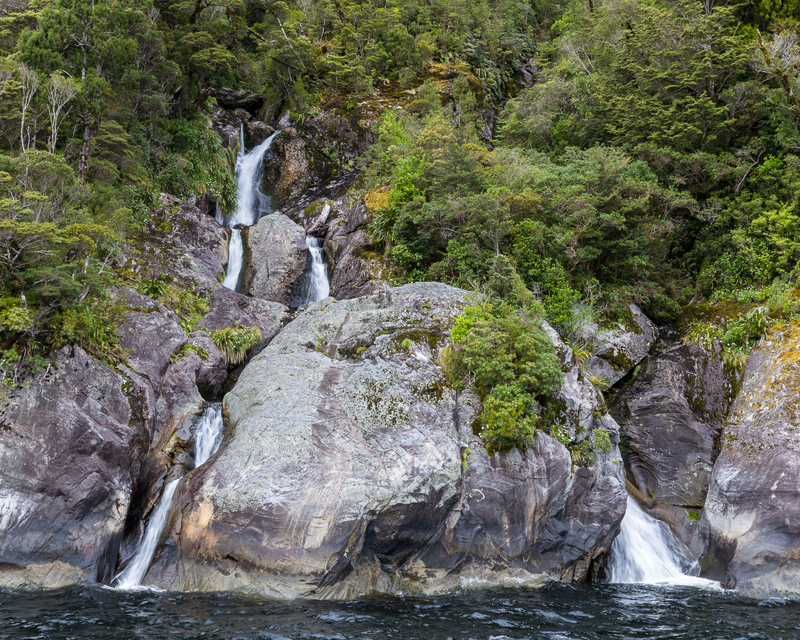 The access to Doubtful Sound is also much more involved: the first step is to cross Lake Manapouri. Just one day ago, I was glancing out over the lake, and now I was cruising across it. 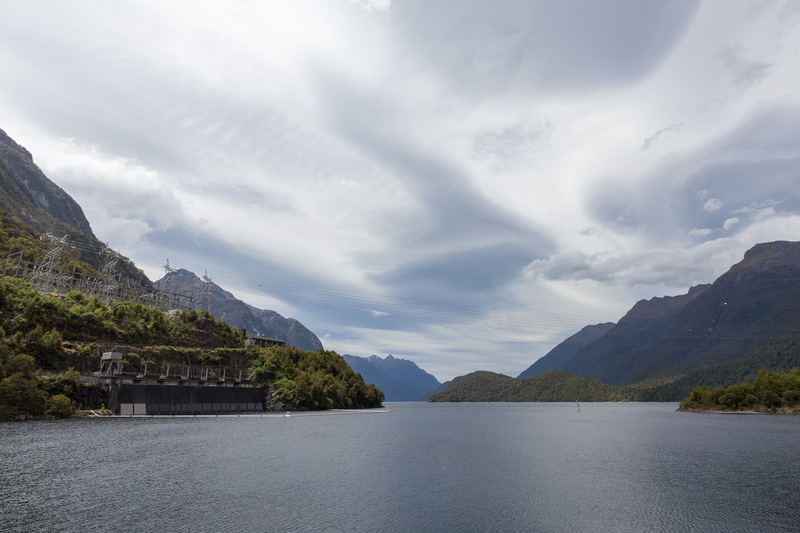 We then boarded a bus to take us from West Arm, the power plant that in the 1960s was supposed to use the raised water levels of a dammed Lake Manapouri to provide electricity, to Deep Cove, one arm of Doubtful Sound. The view of the fiord from Wilmot Pass is perhaps the best chance to peek at the full extent of the fiord. We steamed toward the entrance of the sound in calm waters, all the while staring up at the sheer cliffs around us. 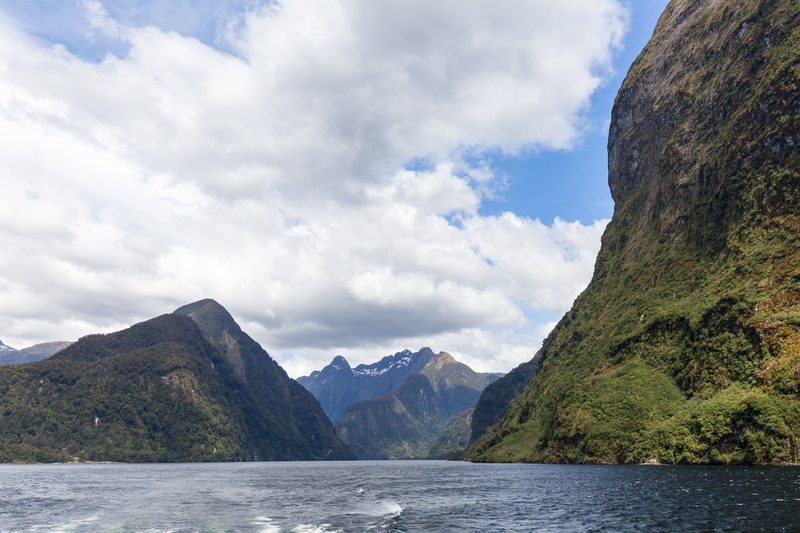 Despite Milford being the more-visited and better-known fiord, Doubtful Sound actually is New Zealand’s deepest, reaching depths over 420 m. The nature is simply exquisite. Scars from various slips were evident on our journey, though we heard and saw none on our cruise. With little rainfall the past days, mostly only large waterfalls were evident. The captain maneuvered our boat close to a small series of falls that was fairly manageable to photograph — it’s hard to convey the scope of the larger waterfalls that plummet hundreds of meters. As we approached the entrance to the fiord, the waters became noticeably choppier, and the staff closed off the bow to prevent the swells from tossing anyone over. We stopped and turned around short of the Hares’ Ears, a pair of rocks effectively marking the wide entrance to the fiord. According to the guide on the cruise, waves had crashed over the ears before, though on our visit the ocean was substantially calmer. 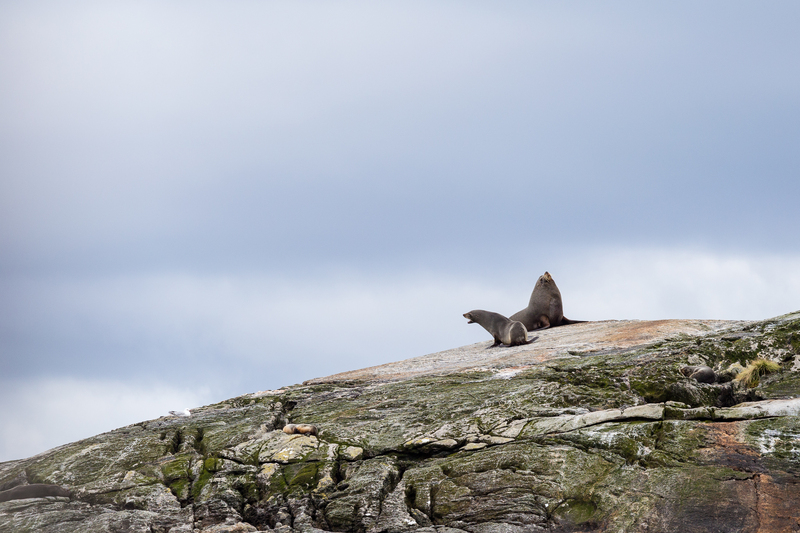 It wasn’t so calm that it made photographing basking sea lions any more straightforward, however! One of the highlights of the Doubtful cruise is a moment of silence seemingly smack in the middle of the fiord. The captain shuts off the engines, guests are asked not to move around on the deck, and the boat floats for a good minute or so. The stillness is astonishing. We barely had any wind, and I heard the New Zealand flag flap just a few times when a gust was hard enough to disturb it. The South Island might not be very densely populated, and here, with only quiet and rock to surround us, we had a taste of just how infinitesimal our essence was. The cruise I had booked was effectively a full-day affair, but the more spectacular option is to take an overnight cruise of the sound. As we headed back to Deep Cove, the overnight boat was heading out. 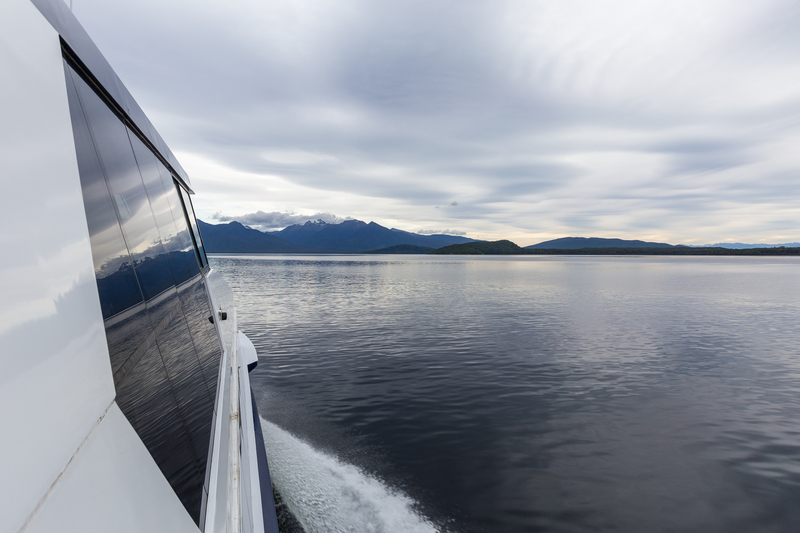 We boarded the catamaran back to Lake Manapouri after the bus ride. By then, the skies had started to get more ominous. The block of calm weather that had lasted from my first day at Luxmore Hut until that afternoon was starting to be replaced by a storm blowing in from the Tasman Sea. While we stayed dry the whole day, a trip to the Fiordlands wouldn’t be complete without some precipitation, and the clouds began to indicate in no unclear terms what was coming our way. Before I left for New Zealand, I had grand ideas about the most colorful sunrises and sunsets I would ever have seen in my life, but until this point I hadn’t seen one that absolutely knocked my socks off. I awoke on my last day of exploration in NZ, looking outside and laughing to myself as an endless stream of water came from above. It certainly made my day easy: I drove toward Milford without a specific destination, occasionally taking side roads or pulling over to snap photos within walking distance of the car. I arrived at Milford before the hordes of tour buses streamed in, using the light drizzle to put my camera’s weather sealing to the test. 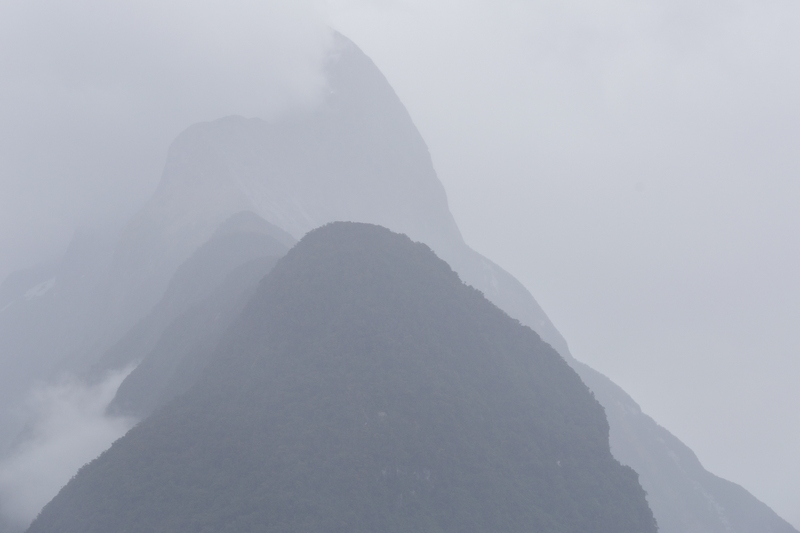 That Milford Sound is so visited is not particularly surprising. 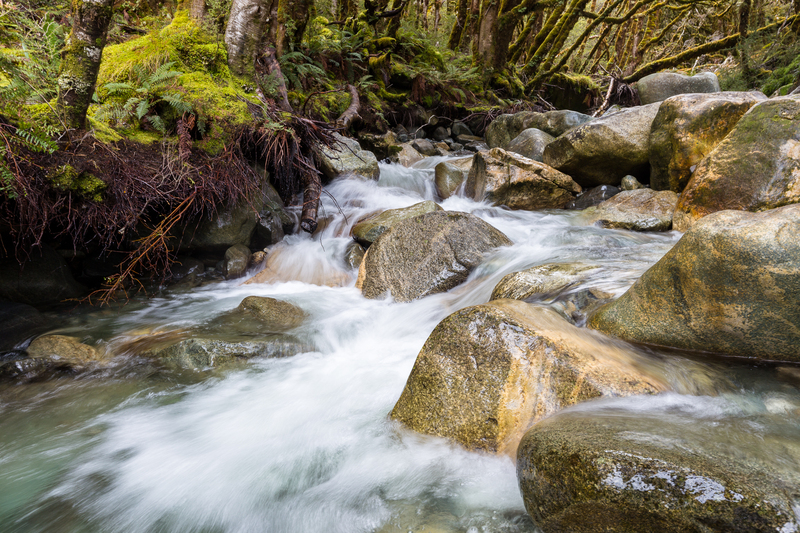 It’s easily accessible, has mesmerizing views, and offers natural awe that few other places have or can match. Despite being able to take the day easy, I found myself wishing that I didn’t have to consider storing wet clothes for the next three days as I traveled back to Germany — I found myself wanting to explore all the hikes along the road to Milford, all the sites that the tour buses also skip. I almost couldn’t believe the moodiness I saw, but despite my most fervent hopes, the rain never subsided. 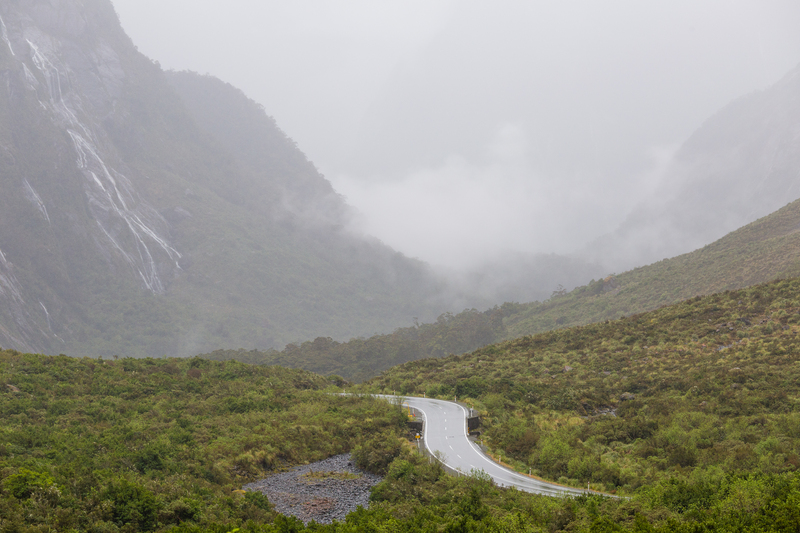 If Doubtful Sound was fairly dry the day before, I could only imagine what the rain on my last day was doing for waterfalls there. I was certainly happy that the day of my sailing was dry. Sitting inside a boat to take in the fiords would have been far less spectacular. In front of me, cliffs along the road to Milford seemed to be one glistening sheen of water, the road itself practically a mirror. 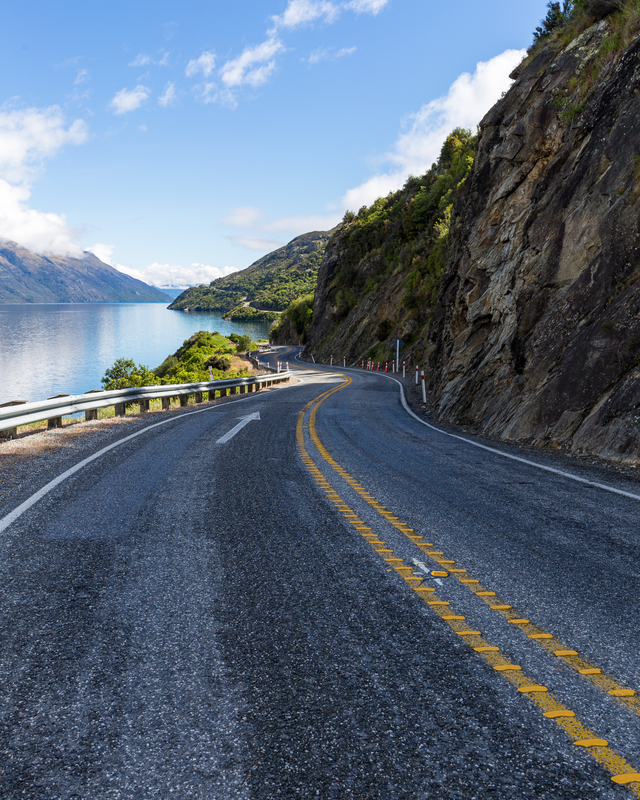 Tourists seeking out Milford Sound tend to make it their main destination, but stops along the way might actually be even more impressive. With the rain showing no sign of letting up, I didn’t actually hike any of the several options that branch out from the road into Milford, only pulling over occasionally if viewpoints were fairly close to the car. One of the popular stops along the way is the roadside Christie Falls. As on the Kepler, I didn’t have my tripod with me, so timed my handheld shots to avoid blur from vehicular and pedestrian traffic on the bridge. There wasn’t much of a crowd as I shot, but I couldn’t help but contemplate if, somewhere in this incredible wilderness, there was an even more breathtaking vista to be seen. The incessant rain and humidity ended up being too much for my camera, and by lunchtime my 6D’s LCD screen had stopped working. I hoped letting it dry out would get things back to normal, but for the rest of the trip I had to rely on completely manual metering. It’s as if the camera was trying to keep all the memories of the past fourteen days to itself, not showing me what my own eyes had seen. 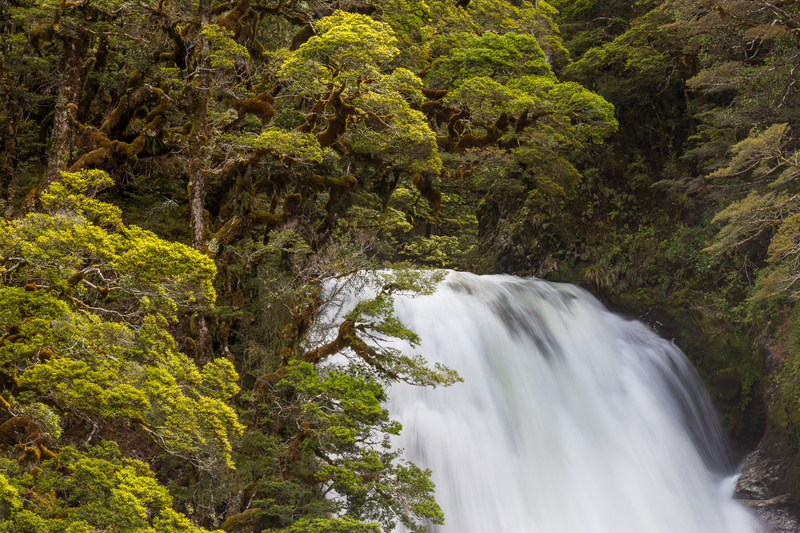 Although a primary motivation for going South Island was to see more of the landscape that had so piqued my interest almost two years ago, I also recognized from my time on the North Island that it wasn’t just the land that was special. In my first extended period away from home, in 2011 I was practically dumbfounded when my notifications of late arrivals at various hotels in the Alps were cheerily addressed with a key left at reception and an empty registration form for my personal details. New Zealand’s hospitality appears equally boundless. In remoter reaches there’s an unpretentious tacitness to living here that seems to embody down-to-earthedness in its most wholesome form, and I think that’s ultimately a large part of what drew me back to New Zealand. Respect and natural conservation is important here, but in the background there’s a humility and incredulity toward others who venture thousands of miles to a place New Zealanders simply call home. For those travelers, New Zealand absolutely offers solitude or healing or meaning in the silence, but don’t mistake the quiet for emptiness. The spirit of those who inhabit this — with no negative connotation to the two following adjectives — most remote outpost of the world is proud but respectful, inquisitive but polite. Inhabitants who maintain such a positive, clear outlook are admittedly rare, and in such a pristine country they’re certainly not to be found everywhere. Strangely enough, against the curvy roads and clear waters and deep blue skies, it’s not necessarily these visual amuse-bouches I sought out that stayed with me most; it is rather the people I met along the way who shared their thoughts and their stories. In my view, this makes New Zealand perhaps unlike any other country I’ve ever visited and simultaneously reveals that a land appearing quite empty and untouched is rather completely the opposite. The South Carolina no-seeums are eagerly awaiting your return! They hunger for your presence even as they make-do with me in your absence.